It’s no wonder that iPad Air and mini – both is nice and capable with a very big price tag of its own. And this price becomes sky high in countries like Bangladesh where there is no official channel to sell iPad directly by Apple. So it’s all about pocked cutting business. There is only one benefit of all that. Bangladeshi customers can buy their desired tablet almost at the same time of US people, that’s way before other countries. As example the latest iPad is available in Bangladesh for almost one and half months but it only released yesterday in India officially. As of talking something about iPad 2013 models, iPad Air is 20% thinner, 28% lighter and has 43% smaller bezels than last year's iPad 4. The tablet features a 9.7-inch Retina display and resembles iPad mini a lot. It is 7.5mm thick and weighs 1 pound; Apple claims it is the thinnest full-sized tablet in the world. The new iPad Air uses the same 64-bit A7 chip and the M7 motion co-processor that was introduced recently with the iPhone 5S. It can open files and render graphics twice as fast as the iPad 4, while still promising the same 10-hour battery life. The Retina iPad mini has twice the screen resolution than the first model at 2048x1536 in the same 7.9-inch display. It also runs on the 64-bit A7 chipset, a huge upgrade over the A5 chip used in the previous version. This model is a huge upgrade over the first-generation iPad mini. 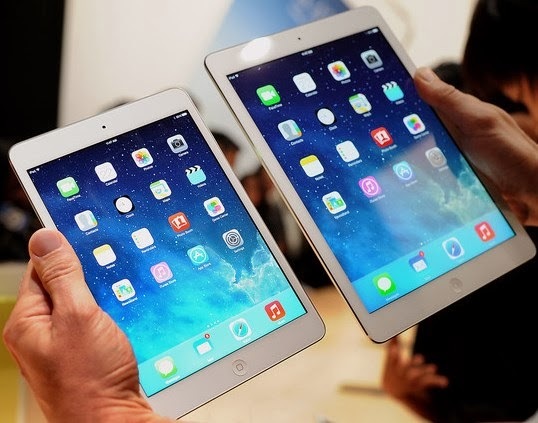 Here are the retails prices of iPad Air and iPad mini in local market of Bangladesh. Keep in mind that the mentioned prices are the maximum retails price. So you can check for less if available around you.